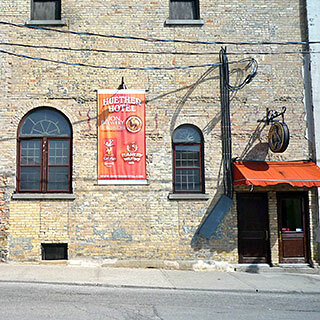 Kitchener and Waterloo (KW) have a very respectable cafe-factor, with plenty of places to hang around, eat and drink. There is also plenty of variety, with the styles somewhat reflecting the differences between Kitchner and Waterloo themselves. The following reviews are based on a visit in May 2011; due to time constraints, we only got to visit most places once, and only had time to visit places that were recommended by locals. In other words, most of these places are at least pretty good, and there are no really negative reviews for comparison. We neglected to visit Tim Hortons. 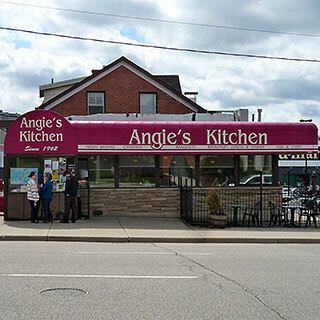 Angie’s Kitchen is an old-style Mennonite family diner, with a serious breakfast menu, covering the full range of fried stuff, pancakes, omelettes, waffles and the like. There is also a lunch menu and an intriguing dinner menu that features ‘Angie’s Country Dinners for Two’ and various traditional dishes. Although the interior looks very basic, there is nothing wrong with the place: the food is good and the atmosphere welcoming. Unsurprisingly, it is as popular as it is well-known and was packed for our late Saturday-morning visit. Overall, this smaller prototype for somewhere like Cora is well worth a visit. 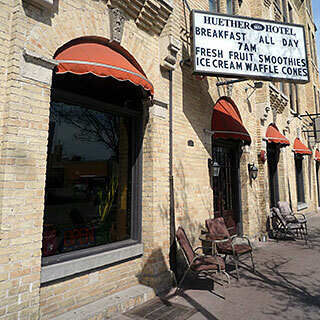 Cafe 1842’s location, on the ground floor of the Huether Hotel, make it more interesting than most cafes because of the separate rooms, including a big pool room upstairs at the back. Unfortunately, though, it seems to lack the competition’s atmosphere and comfortable chairs, and so remains no better than an average option, along with Starbucks and Coffee Culture. However, don’t forget that this means good coffee and sweet snacks and nice service, so you could also do a lot worse. 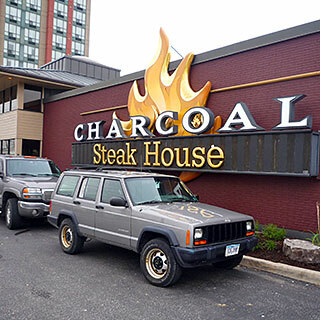 Charcoal Steak House is an upmarket restaurant whose varied menu features classic dishes in a matching atmosphere. The menu is centred around steaks, unsurprisingly, but there are alternatives such as lobster and sashimi. The interior is very serious, with the impression of lots of dark wood and leather, but comfortable at the same time with a definite sense of luxury. This well-prepared impression of quality is what most characterises the place. The corresponding down-side of all of this is the lack of originality - the kind of conservatism that excludes pleasant surprises. Charcoal is pricy but worth it. This is the kind of dinner that it is deeply satisfying to have your employer pay for, which probably explains the suits and corporate chatter. This here is your basic no-frills diner, with simple food served cheap and fast. It is not a particularly big place, and at first glance would be easy to ignore, which would be to miss out on something original and good. 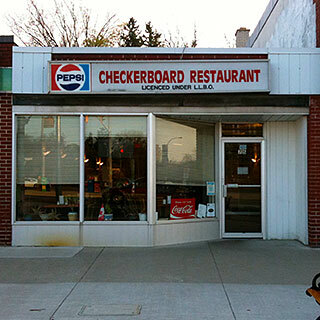 The Checkerbord Restaurant is the real thing done well, with perhaps not such much passion as good care. We certainly enjoyed the sausages, mash and carrots. Without an ounce of pretension, the nondescript atmosphere (including the inevitable television) is immediately easy-going. We most enjoyed the excellent super-friendly service, although that reportedly depends on who is working when you visit. The kind of place you have to visit once. You might just make a habit of it. 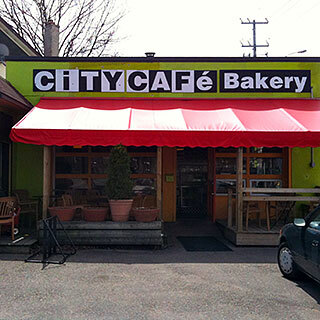 City Café Bakery is the place to go coffee with bagels and brownies and other assorted snacks, including several kinds of tart. Unlike most of the places we visited, this is more out of the way, with a big car park instead of a city-centre location. There are not very many tables outside, and the car park is not the most appealing scenery, so you are better off inside. The interior is pretty unusual; the counter area feels more like a workshop than anything else, with the space and aesthetics mostly about the kitchen, while the side room retains the tiled walls. The eclectic interior and atmosphere makes the place fun, but it’s really about the excellent breads and cakes. 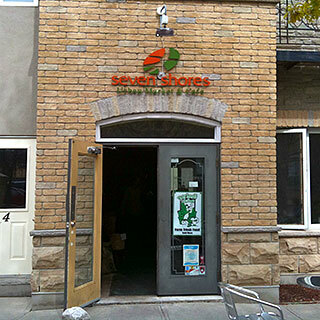 Our bagel and brownie were great, and the butter tarts are reportedly the best here. If you don’t mind the trip, this is worth the detour for better bagels and tarts; this is perhaps the best place in town for that kind of thing, but not so handy for uptown. 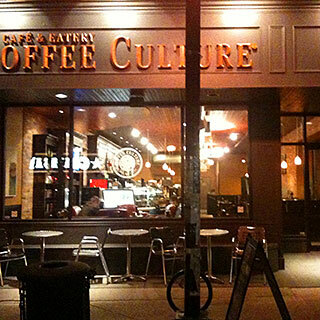 Coffee Culture is a cafe chain with a fixed formula for its menu and decor. However, as a response to the likes of Starbucks, the formula is a good one as far as the interior and atmosphere goes, opting for a less modern look that is reminiscent of a old-fashioned bistro, or at least its stereotype. A nice touch in this branch are the window-side booths that provide an alternative to the usual tables, and the ideal spot for work or study. There is nothing particular to say about the menu, since we did not stay for a meal, but nothing wrong with it either. Like Caffe Nero in the UK, Coffee Culture provides a variation on the usual coffee chain theme with a different aesthetic. You could do worse. 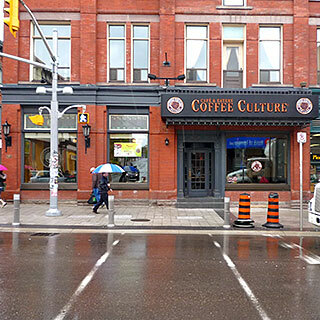 This Coffee Culture differs from Kitchener’s, by being smaller and more cosy, with armchairs instead of booths and a less busy feel. This makes it seem more like a Starbucks and therefore more familiar, but perhaps correspondingly less interesting. Either way, the result is a comfortable and sociable place to hang around, even if it lacks Princess Cafe’s unique cool factor. Cora is a big and busy family breakfast place that is popular enough to have a long queue* outside on a Sunday morning. The menu is based around fried breakfasts and fresh fruit, often on the same plate (which is weird from a European perspective). The focus is on good value, rather than the best ingredients or the cheapest food, which results in the kind of place that a lot of people enjoy and regularly return to. 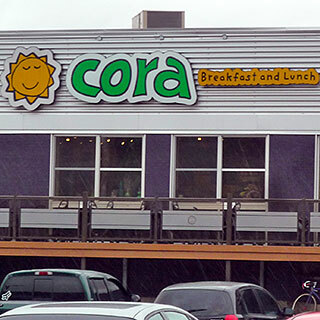 Cora is a Canadian chain, started by Cora herself in Montreal. This is the best kind of chain: it delivers well on its core competence (the menu), giving people what they want without being pretentious. Eating here is a great move for the kind of weekend brunch that sets you up for the rest of the day. There is perhaps nothing about the place that makes it somewhere you have to try, but you probably will anyway, sooner or later. The Duke Street Muse is a small lunch cafe with an unusual look, whose white surfaces and plain colours make it look more like a clean and modern office canteen than the kind of artfully-designed interior that you usually find around here. There are only a handful of small tables to sit at, if you are going to eat here, so you may end up with just take-away*. This means that although there is nothing particular wrong with the interior, it is more boring than it is comfortable or stylish. The menu features a random selection of vegetarian and vegan dishes, with Mexican and Asian influences. The wraps and quesadillas are excellent as are things like the home-made hummus with black pepper. The food is tasty and healthy and probably puts most of the rest of your diet to shame, not to mention your cooking. This place is a great choice for lunch, with the kind of food that makes you reach for the cookbook to try to copy it. Fáilte is a smallish Irish pub with a North American flavour and local beers, but little in the way of Irish tat and reproduction Guinness memorabilia. 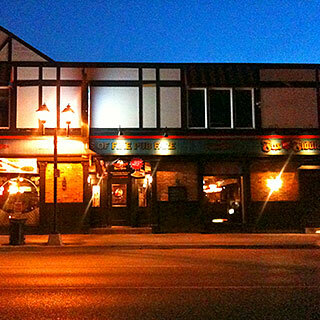 This makes it fairly low-key in the Irish-pub category, and a nice change to the kind of place that got the whole interior from that fake-Irish-pub warehouse that must exist somewhere. The atmosphere is nice and lively, does not really have much to do with anything Irish and is all the better for it. The beer is good too: the selection is not huge, but the pint of Canadian wheat beer was itself justfification for the visit. Good place to meet up for a pint: worth a try to see if it is your kind of thing. Fox & Fiddle is a big pub with a standard selection of beers and standard menu, and standard everything else in the negative way that makes this like Tim Hortons but without the charm. This makes it the worst kind of chain pub, as if the management are not really trying and fail to deliver on either the core proposition of the chain or be individually good. The result is the worst of both worlds, lacking cosiness or grandeur, classiness or authenticity. There is really very little to recommend this pub, except perhaps the fact that there is always likely to be room for a large group, what with it being big. Otherwise, just go to Huether’s instead. Kava Bean Commons is a cafe with a slight restaurant feel, and it is this apparent ambivalence that may be its greatest weakness. It is not a bad cafe, but it is somehow not quite right, in the way that the armchairs look good but are not actually that comfortable, for example. The same applied to the service on our visit. There is a good chance that this place is better for food, as the menu is pretty interesting, but we did nottry it. 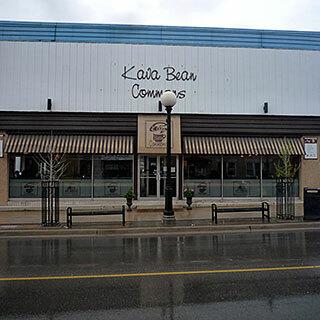 Note: one added bonus are the specials announcements on Twitter @KavaBeanCommons. The Lion Brewery Restaurant is a proper pub in the basement of the Huether hotel building that serves proper beer and proper food. The interior features low ceilings and lots of varnished wood, that would give the place something of a nautical ships-cabin feel if it were not to big for that. The menu features a fairly wide variety of comfort food - soups, steak, pasta, burgers and pizza, for example. However, what is far more interesting is the beer menu, which offers a selection of beers ‘brewed on the premises’ - the ideal accompaniment to aforementioned comfort food. Great place for dinner with your pint. 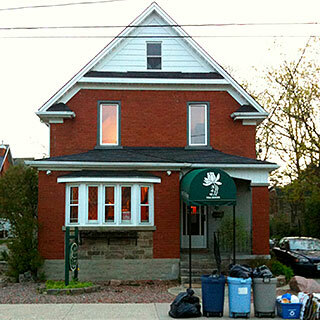 Lotus Tea House is a vegetarian and vegan restaurant with a mostly Asian menu, unusually situated in a residential street. The menu and food are both interesting and tasty, with more elegant simplicity about them than at the other places we tried. There is also a big selection of exotic teas, including some novel combinations. 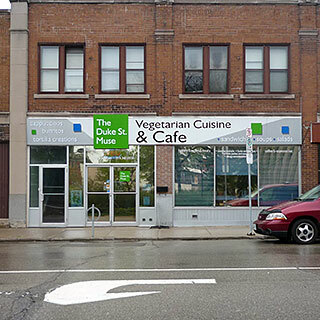 However the quiet interior with its slightly stuffy atmosphere is more conducive to some kind of formal lunch than hanging out with friends: this place is certainly not the most fun you can have around here, which is a shame because vegans can be fun too. The positive side is that the subdued atmosphere is rather relaxing. In any case, this place is definitely worth a visit for the food and the novelty value, at least. 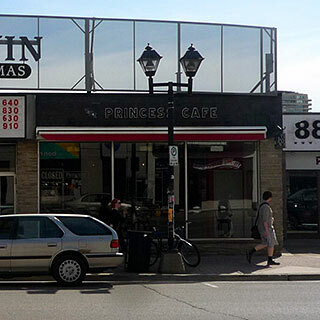 If the coolest cafe in Waterloo is Princess Cafe, then Kitchener’s answer is Matter of Taste: although it lacks its own cinema, it has more comfortable furniture, including a decent sofa, and a mellower feel. The cafe is split into a coffee bar area at the front, with seats in the window where you can watch passers-by, and a quieter lounge area in the back. The menu is standard cafe stuff, but this place is more about coffee than food. You get a choice of roasts, perhaps to add a little variety if you are going to ‘waste’ a whole afternoon here with a pile of books from the big second-hand bookshop next door. In 2008, a second location opened in the Waterloo Town Square shops: that one also looks pleasant enough, but ultimately nothing can compensate for the soul-destroying horror of being in a shopping centre*. 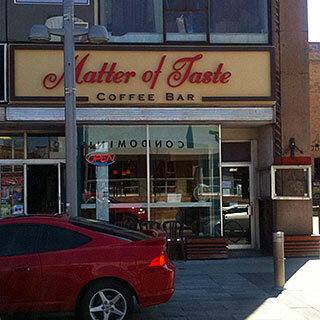 Either way, Matter of Taste is highly recommended. Princess Cafe is an excellent example of a relaxed arty cafe attached to a small arts cinema that, like many others, shares a little of the cinema’s cultural vibe. As well as the inevitable framed film posters and the understated music, the relaxed atmosphere comes from the informal style: menu on a blackboard and furniture that mixes old-school white-painted chairs with varnished solid wood tables. The only thing missing is a sofa and a couple of armchairs. The menu is based around a broad selection of creatively-filled toasted panini, with various sweet stuff and soup. However, the feel of the place is less about lunch and more about hanging around all afternoon, reading or writing with lots of coffee and the occasional snack. It’s almost to quiet to go with friends to chat. 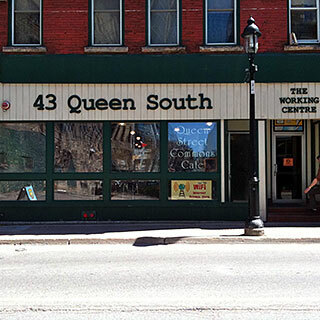 Queen Street Commons Cafe is a ‘community meeting space’, rather than a normal cafe, being part of the Queen Street Commons project. In practice, this means that the interior is a big space with the cafe on one side, and an indeterminate halfway point where the tables peter out and the potential for something else starts. It also means that the cafe has much more of a hippy style than the average independent cafe: the staff are attached to the project, the menu features alternative and healthy veggie food with something of a home-made feel, and even the random collection of furniture seems to have grown organically. The food is good, with a home-made style that makes it more interesting than the more contrived or processed versions that you get elsewhere. It is also outrageously cheap, which is another thing that makes this cafe about as unpretentious as you will find anywhere. This cafe may be a little rough around the edges, and perhaps even lacking in style or sophistication, but it easily makes up for it with a smile and the kind of good food on your plate that makes you re-evaluate what you get everywhere else. Seven Shores seems to be a yuppie cafe with a slight hippy flavour, but less convincingly than Queen Street Commons Cafe, perhaps because the decor and furniture looks more artfully rustic than genuinely so. The local products for sale on the shelves are real, and look good, but are perhaps not the reason to be here. Ultimately, this is a nice quiet cafe to hang out in, but not an exciting one. The result is decidedly average, but probably great in its target market. 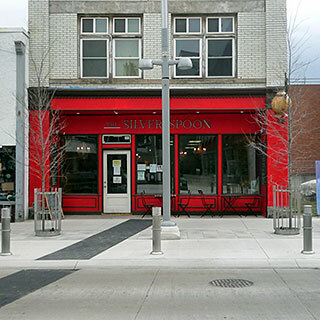 The Silver Spoon is, at first glance, a chocolate shop* with a couple of small tables by the window where you can drink a coffee with a tasty truffle on the side. Closer inspection, however, reveals a more subdued ‘English Tea Room’ at the back, where a motley collection of somewhat dated comfortable chairs and tables await, making this somewhere to linger. The chocolates are very good, but then so are the cookies and other sweet nibbles. 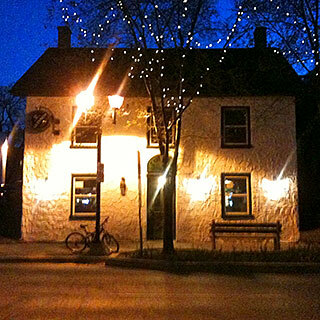 This place’s well-executed quaint charm make it something of an exception among the more urban cafes around the rest of Kitchener, and a welcome change of pace with an almost rural style. Although Starbucks is something of a known quantity, there are variations and this is one of the better ones, mainly due to it having enough windows to make it light and pleasant. The usual good stuff is there, including a couple of comfortable chairs, although this place is a sufficiently popular spot that you are lucky to get a seat half the time. There is not so much as a terrace as a couple of tables next to the busy road, so this remains more of an indoor location or somewhere to stop by for take-away. 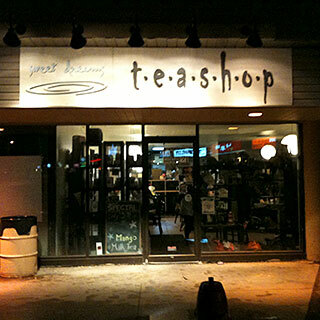 Sweet Dreams Teashop is a student cafe with a big menu of bubble teas and other sweet drinks, catering to a young and mostly-female crowd. Unusually, the cafe also sells handbags* and other accessories, which is perhaps what most emphasises its female focus. Unusually for cafes in Waterloo, service can be slow or erratic, although no less friendly for that. 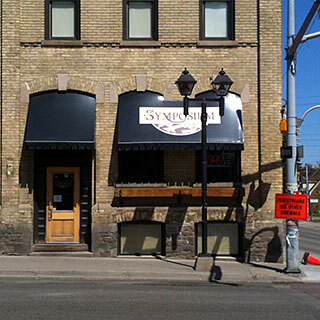 ‘Sympo’ is a great all-round cafe/bar/restaurant that does not particularly suffer from being part of the Waterloo Hotel, or a chain of cafes. The careful selection of various kinds of armchairs and other furniture, jazz or similar, and the cocktail menu combine to make the atmosphere more of a French-style brasserie than most places around here, and although fairly contrived, the whole thing works pretty well. The classier atmosphere makes it tempting to upgrade from a coffee or beer to wine or cocktails, and the menu helps, with a selection of wines by the glass and martinis. There is also lots to eat, including a cake selection that certainly needs further investigation. Overall, this is the place to be if you fancy something more upmarket than a beer across the road at Huether‘s, or a coffee at Princess Cafe. 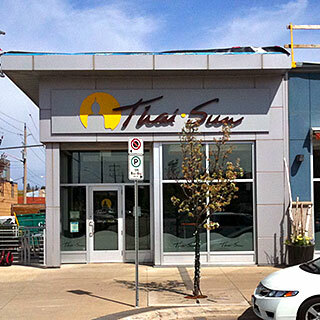 Thai-Sun is a straightforward Thai restaurant with a simple and accessible menu and modern decor. The menu is pretty easy to get to grips with, with plenty of variety - so something for everyone. The food is good as well, although it is notthing special compared to Thai food elsewhere around here. Unfortunately, the service was not great on our first visit on account of being slow, which was a shame because our table was in a dark corner that was not the most inviting place to hang around. A good place to eat out with a group of friends, but nothing special. 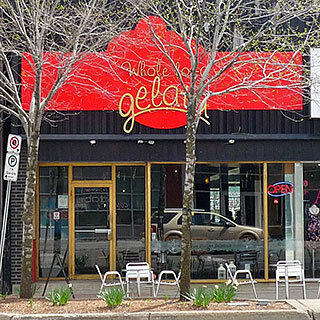 Whole Lot-A Gelata is an Italian-style ice-cream parlour, with lots of ice-cream and a colourful shiny interior who bright lights make for a cheerful atmosphere and a nice wholesome experience. The ice-cream is the good stuff, which is why you are here, and makes a change from the usual coffee or beer options. Apart from that, there is nothing particular exciting about the place for anyone who is less than fanatic about ice-cream. Recommendation: eat at home and go here for coffee and dessert. 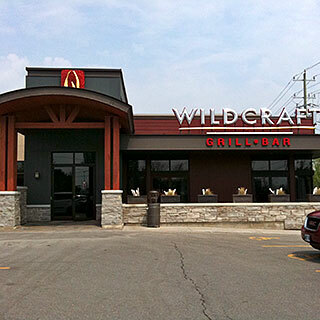 Wildcraft is a big grill place that is split into a separate bar and restaurant that both serve the same food, but in noticeably different surroundings. The bar area is more lively, with television adding a downmarket boisterous touch, while the restaurant has a more respectable feel, which makes it both less distracting and less fun. The food is great: relatively upmarket burgers, salads, steaks and the like. The decor is pretty stylish, the furniture comfortable and the service good, which makes this a pleasant place to have a meal. This place what it does very well, with great food and atmosphere, and decent martinis. Our burger and Caesar salad were both very good, with a little more refinement than the average. Recommendation: come here to celebrate, assuming that you can regularly come up with a good-enough excuse.